Brett Gardner slated to start the season in centerfield for injured teammate Aaron Hicks. 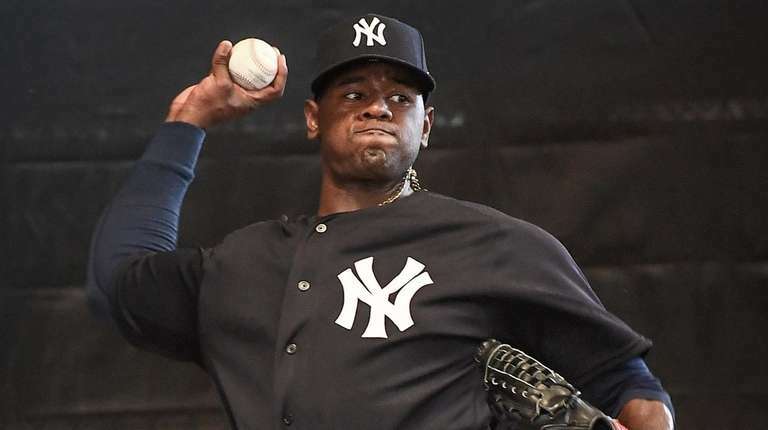 TAMPA, Fla.— Step one in Luis Severino’s rehab was a positive one. The righthander picked up a ball Wednesday morning for the first time since he was shut down March 5 with rotator cuff inflammation and made 25 throws at 60 feet. “I don’t feel anything at all,” Severino said of his right shoulder afterward. The 25-year-old did say he felt “a little bit off,” but only mechanically. Severino, whom general manager Brian Cashman has said likely won’t be back until May at the earliest, is scheduled to play catch again on Thursday, this time making 50 throws at 60 feet. With Aaron Hicks set to start the season on the injured list, that means centerfield duties will fall to Brett Gardner, who will shift there from left. Before the Yankees played the Astros Wednesday in West Palm Beach, Aaron Boone said Gardner will start in center in the March 28 season opener and then, after the March 29 off day, likely play six straight. “He would be the guy,” Boone said. Hicks is eligible to come off the injured list on April 4. If he’s not ready and Gardner needs a day off, Boone said Tyler Wade could be an option for center. Wade has been used primarily as an infielder in his career, though he’s seen some limited time in all three outfield positions. Wade, who started Wednesday’s game in centerfield, was removed in the fifth inning because of hip tightness but did not sound too concerned afterward. Wade added that he usually deals with tight hips anyway, and the long bus ride from Tampa to West Palm Beach may have aggravated the issue. The plan is for him to return rather than stay with the Yankees for Thursday’s game against the Cardinals in nearby Jupiter. “I don’t think it’s a big thing,” Boone said. Jonathan Holder was used as an “opener” for Wednesday’s game and pitched two scoreless innings in the Yankees’ 2-1 loss to the Astros at the Ballpark of the Palm Beaches. “I don’t have a problem with it,” Holder said. “I like it. It’s cool. It’s innovative.” ... Greg Bird said he was fine despite taking a fastball from Wade Miley off his right elbow in the first inning . . . Gary Sanchez’s RBI double accounted for the Yankees only run.